Alderson’s Awards West-Printwares celebrates everything from Valentine's Day to the opening day of baseball season. They love having a good time. Photo courtesy: Alderson’s Awards West-Printwares. Tom and Karen Alderson have been part of Alderson’s Awards West-Printwares since 1986. Originally founded in 1972, the business’s longevity can be attributed to their community involvement, local businesses relationships and connection with family and employees. Tom, who is the general manager and has roles in sales and production, enjoys working with his wife, Karen, and son, Alex. Tom and Karen Alderson enjoy their grandsons. Photo courtesy: Alderson’s Awards West-Printwares. 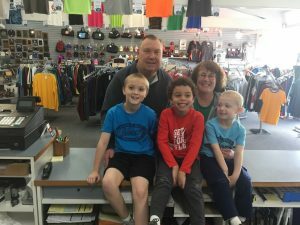 The couple’s grandsons are also familiar faces at the production facility and storefront. Tom and Karen’s children and their cousins spent their childhoods playing there while the couple worked. Tom recalls the kids playing “store” and using the intercom. 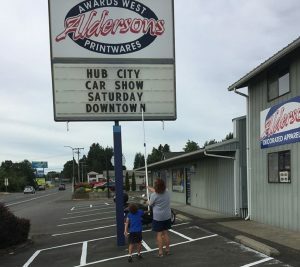 The kids, now in their 30s, reminiscence that some of their favorite childhood memories took place at Alderson’s Awards West-Printwares. Today, Tom and Karen still host family dinners at their facility, showing that work and family time can happen simultaneously. “The kids love it here and it’s a special time for us,” says Tom. Karen Alderson updates the reader board while one of her grandsons helps. Photo courtesy: Alderson’s Awards West-Printwares. Local schools turn to Alderson’s for awards and other products. The company loves to give back by supporting youth events and sports teams all over Lewis County. Tom and Karen’s favorite way to give stems from their own tragedy. In the floods of 2007, the business took on two feet of water. “We were blessed to have people working here so fast, a lot of them from Centralia High School, teachers and friends of friends,” recalls Tom. 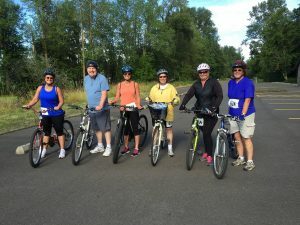 Alderson’s Awards West Printwares sponsors Ride the Willapa. Pictured are Kim Schrader, Tom Alderson, Corrina Churchill, Phyllis Stumm with daughter Carrie Spratt, and Karen Alderson. Photo courtesy: Alderson’s Awards West-Printwares. This giving attitude is contagious. Brittany, the daughter of long-time employee, Kim Schrader, is completing her Adna High School senior project by selling Adna Strong T-shirts as a fundraiser for Hurricane Irma victims. Long-time employee Jon Johnson’s twentieth work anniversary was a special event complete with a special award. Photo courtesy: Alderson’s Awards West-Printwares. The company’s “under one roof philosophy” was intentional, but evolved naturally. The business’ history is rooted in engraving. “That’s what we have done since day one and all the other elements have been added,” recalls Tom. “The same customers would order one type of product and it would evolve to more to meet their needs. Starting from industrial engraving to awards, screen printing then piggybacked by the embroidery and, finally, signs and banners. Now it’s a lot of promotional products from pencils and water bottles to balloons. 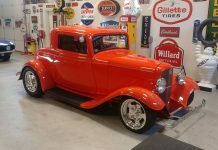 That became the final piece of the puzzle.” Alderson’s is always looking to the future to anticipate what their customers may need. 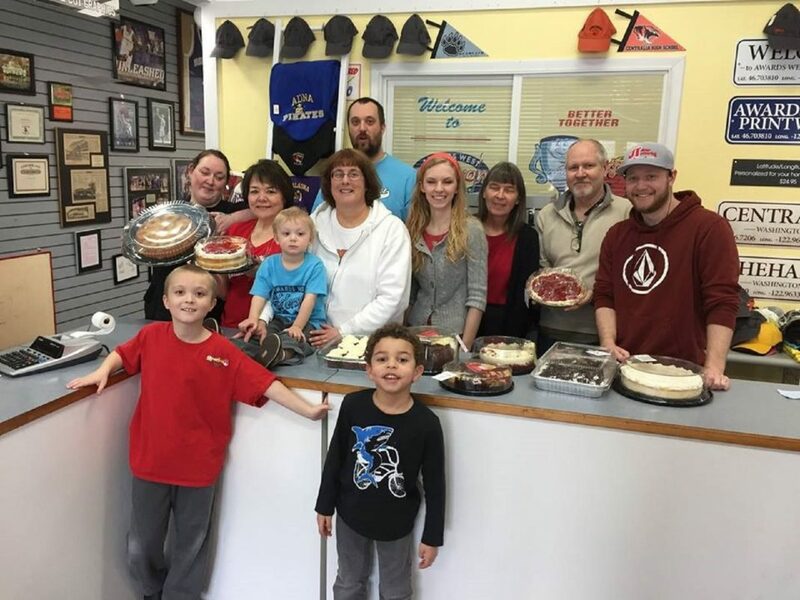 Alderson’s Awards West-Printwares celebrates everything from Valentine’s Day to the opening day of baseball season. They love having a good time. Photo courtesy: Alderson’s Awards West-Printwares. Tom laughs that he is the “worst supervisor ever,” but he does hire good people. He employs individuals who don’t need much managing and are self-motivated. The eleven employees and three family members working there understand what needs to be done and have a mutual respect for each other. 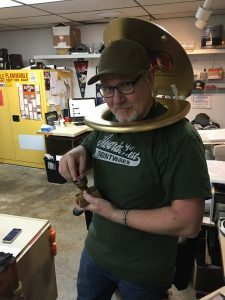 “Customer service is what makes us stand out, yet I think when it comes to custom work, seeing and feeling the quality of the product is also important,” he says.